15% OffAdd to cart to view discount! Clearance item. No warranty, item sold as is! View Specs | Need Help? Upgrade and uplift your outdoor space with a color that lends a subtle pop. The warm red-brown of Caramel interlocking composite deck tiles is reminiscent of cherry lumber -- natural enough to complement existing decor, but bold enough to carry a wow factor. A clean matte finish and extra low-maintenance composition makes for a modern-looking surface that’s quick and easy to pop into place and enjoy, worry-free. Defy mother nature, with composite decking that's designed to withstand the elements. Thoughtfully designed and tested to outperform other composites. Build your own happy place with composite decking tiles for homeowners and pros alike. Composite decking tiles made from recycled materials protect forests for future generations. 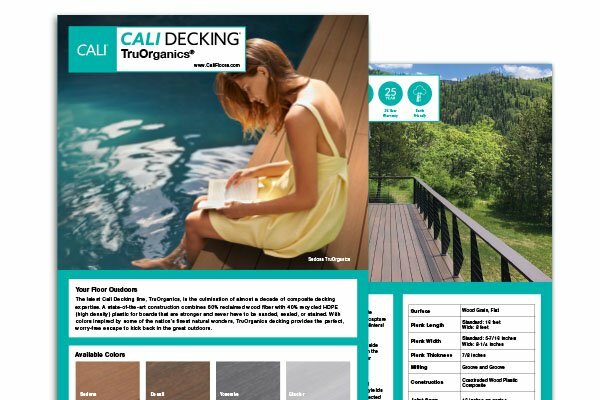 Install BamDeck with confidence by following the official Cali Bamboo Installation Guide. BamDeck® composite deck tiles are so simple to install, you can snap them together in just a few minutes, with no tools required. Q. What are interlocking Deck Tiles made of? A. The four surface planks on each Deck Tile are made of 60% reclaimed bamboo fiber and 40% recycled HDPE plastic. The locking base is made of 100% recycled heavy-duty polypropylene plastic. The instant outdoor makeover. No tools, prep, or experience required. Each tile has a matte finish, ridged surface, and heavy-duty locking edge on all four sides, enabling boundless pattern creativity. The ability to unlock and rearrange tiles means designs can be tested out and fine-tuned. No screws or metal parts allows for easy customized cuts if necessary. Worried about rain or snowfall on your deck? 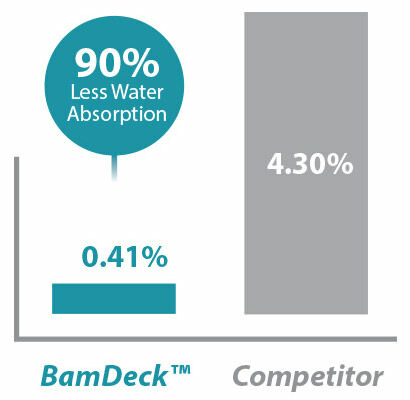 Because of BamDeck®'s superior density, it absorbs 90% less water than other composites. Mold, mildew, and decay don't stand a chance! We're here to help! Call us to chat about your project, get expert advice, and learn about pricing. Cali Bamboo's composite deck tiles are built to outperform the competition. But don't take our word for it. Watch the video for a side-by-side demonstration.